Available from bookstores now, launch on Sunday 9 March 6pm. Details below. Annie, or more correctly Dappled Annie, and her little brother Robbie live in a remote (and idyllic) location; their father is the lighthouse keeper. I know this is supposed to be the lighthouse at Castlepoint (the afterword tells me so) but it could be anywhere along the New Zealand coastline. For me, it’s Burgess Island in the Mokohinau Islands of the Hauraki Gulf. A place so remote as to be perfect. With busy parents, the two children in this book only have each other and their imaginations to fill the long summer days. Annie likes to get close, very close, to the natural world. When she stands surrounded by the interleaving branches, the individual trees come alive. To Annie, the trees are alive; she hears and converses in their language. I found the way the trees come alive a little forced, but in reality, how else do you make trees come alive? The wind brings a pivotal creature – the Tigrish – into the story. And the adventure begins. It was easy to get swept up in the tale and by the end I came to view the hedge as alive as Annie herself. After all, who hasn’t seen faces in a hedgerow or a tree trunk? And noticed the dappled light as shadows come, grow, and eventually disappear? And she captures the musings of a child eavesdropping on a fantail family as they “Pick! Pick! Pick! Me!” The baby fantails call to their father as they jostle for the next unlucky insect he brings. Annie hears the yearning and angst of that family. It’s a lovely original story. Children with vivid imaginations, who love playing outside (like we all used to do), will find some synergies with delightful Annie. All children need to push themselves outside of their comfort zone and Annie and her brother do that – facing their fears and embarking on a unique adventure. This is a thoroughly New Zealand adventure and delightful story. Dappled Annie and the Tigrish will be launched as part of the festival at 6pm on Sunday 9 March at the Westpac Festival Hub, First Floor, St James Theatre, Courtenay Place, Wellington. 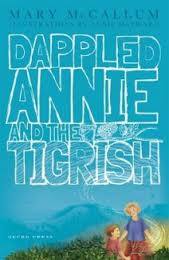 This entry was posted in Book review and tagged 8-12, adventure tale, dappled annie and the tigrish, mary mccallum by booksellersnz. Bookmark the permalink.